Quarterback Glen Perry Jr. picked up most of the numbers. His offensive line created the opportunities for those statistics. Don’t overlook the Mountain View defense, though. 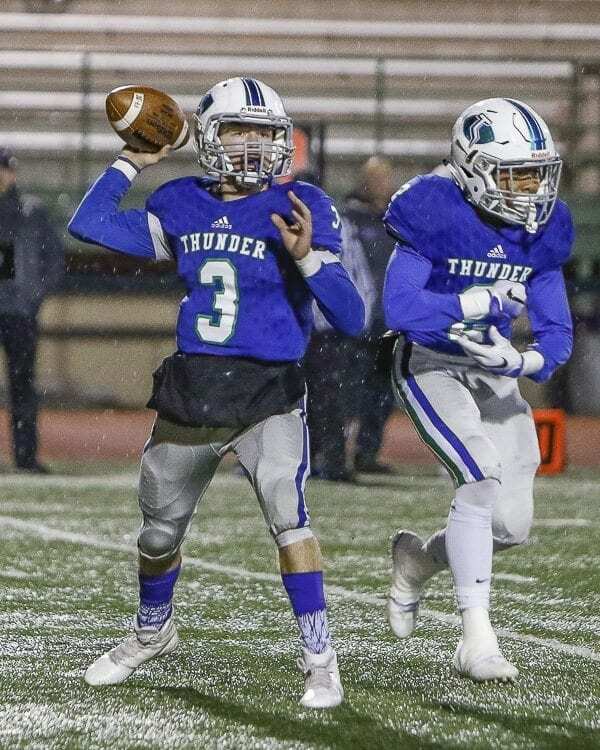 It was all of the Thunder, not just a few players, who put all their talents together Saturday night to clinch another trip to the Class 3A state football playoffs. 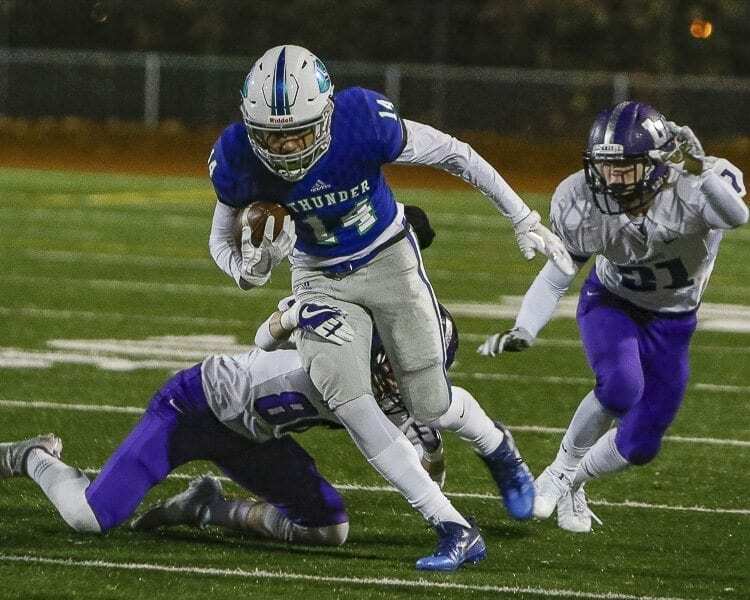 Perry rushed for 243 yards and three touchdowns, and the Mountain View defense held Lake Washington to one touchdown in a 27-10 victory at McKenzie Stadium in a 3A state qualifier playoff game. Mountain View (8-2) will host Peninsula next week in the opening round of the state tournament, most likely Saturday at McKenzie Stadium. It will be a rematch, as well. Peninsula ended Mountain View’s season in the first round in 2016. The Thunder expect a different result in 2017. It is not just the success on the scoreboard that motivates the Thunder. They just love being together. This will be the first time Mountain View has had back-to-back state playoff appearances since 2003 and 2004. The Thunder worked it all out against the Kangaroos on Saturday, earning a crushing blow just before halftime. Perry capped a nine-play drive with a 1-yard touchdown run with 1:19 left in the half for a 14-3 lead. On the next play from scrimmage, Jack Mertens intercepted a Lake Washington pass. Whatever, he held on, then returned it 27 yards, setting up another scoring chance. This time, Tyrell Hall scored on a 12-yard run to make it 21-3 just before the half. The locker room had a pretty good vibe in it after Mountain View scored two touchdowns in 45 seconds. 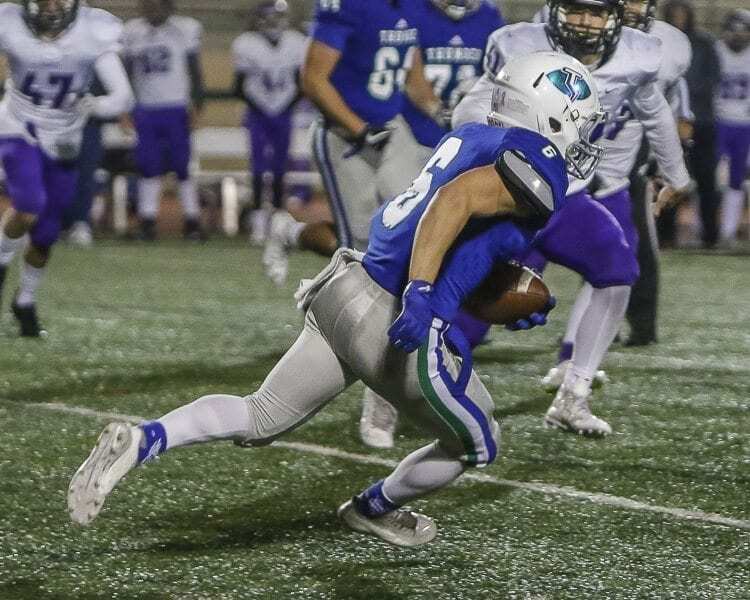 In fact, Lake Washington responded with a touchdown drive to open the second half. The Kangaroos then got the ball two more times, still trailing by 11. The Mountain View defense, though, would not allow the game to get any closer. The Kangaroos got to the Mountain View 36-yard line later in the third quarter. Mitchell Delmage blew up the first-down play, tackling the running back for a loss of 5 yards. On the next play, Roberts sacked the LW QB for a loss of 11 yards. That forced a punt, and that was Lake Washington’s last scoring threat when the team still had a chance for a comeback. Roberts, a stellar offensive lineman, said the coaches were saving his defensive talents until the playoffs. 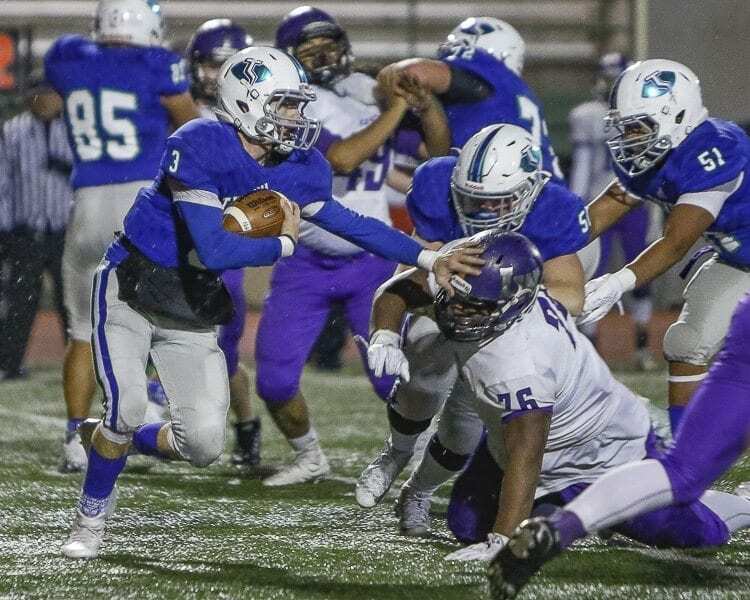 In the first half, Hegel had two sacks, including one when Lake Washington moved in the red zone. That sack was part of a Mountain View effort that led to the Kangaroos kicking a field goal instead of scoring a touchdown. The Mountain View offense was a few passes here, a handoff or so there, and a lot of Perry finding room to run. He had 154 yards rushing by halftime. He also made a sweet pass to convert a third down on Mountain View’s final scoring drive, with Delmage making an even better catch in traffic. That led to a 7-yard touchdown run from Perry to give Mountain View a 27-10 advantage midway through the fourth quarter. The Thunder will be looking for a repeat performance of Week 10 in Week 11 against a repeat opponent. RUSHING: Lake Washington: Ryan Clifford 32-112, James Gardner 1-1, Buchanan 6-(minus 16), Cody Wilson 1-24, Baroletti 3-17. Mountain View: Perry 30-243, Hall 10-25, Jack Mertens 4-8, Andrew Gulliford 3-13, Michael Urruchua 1-1, Team 2-(minus 4). PASSING: Lake Washington: Buchanan 10-19-1-173. Mountain View: Perry 9-13-0-68.